Special Features: Widescreen anamorphic and full frame formats. Writer, director choreographer Bob Fosse made two of the best films of the 70s. "Lenny" was one, "Cabaret" the other. "Lenny" is a tour de force biography about on of the great provocateurs of the last century, Lenny Bruce. Mr. Bruce was a dynamo of wit and acid. He held our society up to a magic mirror which revealed the hypocrisy of our morals and standards. He did so at the cost of his life and freedom. Dustin Hoffman and Bob Fosse combined talents to deliver a truly thought provoking and entertaining film. The film's structure is a wonder to behold. Those who thought Quentin Tarantino turned film structure on its head need to realize that Bob Fosse blazed the trail so brilliantly exploited by Tarantino 20 years before "Pulp Fiction" came out. Lenny Bruce's life is told through flashbacks and interviews with his wife, mother and agent. Although "Lenny" has a pseudo-documentary style, all of the characters are portrayed by actors. The film chronicles Lenny Bruce's life from 1951 until his death by drug overdose in 1966. The acting is superb. Both Dustin Hoffman and Valerie Perrine received Oscar nominations for their work. The film received 6 nominations altogether. The black and white cinematography is used to wonderful advantage. The words of Lenny Bruce provide all the color the film needs. This is a masterpiece of filmmaking from the greatest era of creativity in Hollywood's history. This is a must see movie. 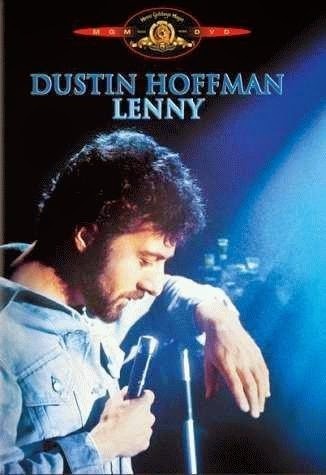 You may disagree with Lenny Bruce's philosophy, but there is no denying the power of this film. Great movie and picture. Good sound. So-so menu and no extras to speak of. Vanilla DVD at vanilla DVD prices. Black and white photography is rarely used in main stream movies anymore. This is a shame considering how effective it can be under the right circumstances. The picture is beautiful. Great variation through all of the gray scales. No artifacts or pixilation. The sound track is mono. It gets the job done as this isn't a movie that cries out for surround sound. I guess the mono track was a tribute to the mono record albums put out by Lenny Bruce back in the day. The menu is in color. I don't know why. It consists of still frames. Simple design, easy to navigate. Only the theatrical trailer. I know there must be a ton of stuff hanging around the MGM vaults they could have padded this out with. Maybe if this one sells, MGM will release a special edition down the road. Worth the price for the movie alone. Serious film buffs who are unaware of the great Hollywood movies of the 70s would do fine to start their studies with this one.